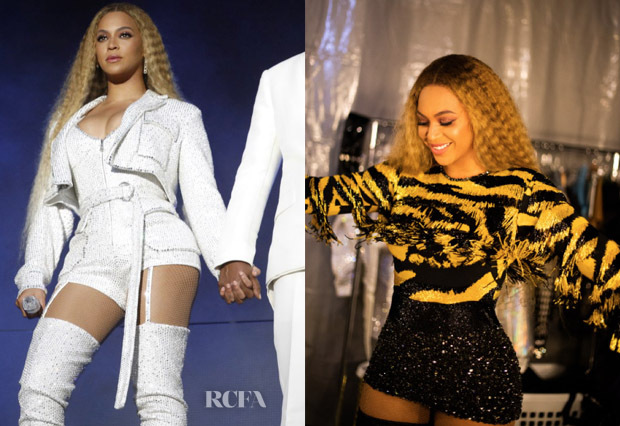 Beyonce Knowles’ next stop on her ‘On The Run II’ tour hit Milan this weekend, where the singer unveiled two more looks. Both were custom made by Roberto Cavalli, and both, of course, featured booty shorts and over-the-knee boots. It would appear that this is clearly going to be a running theme through-out this tour. Of the two, the yellow and black zebra pearly fringe top with mini caviar embroidered skirt caught my eye. It was a high-energy look, for an high energy performer. The first look was styled with Messika by Gigi Hadid diamond earrings.